hey guys! I got my email from cheif yesterday (checked it right now) and it said that I was in! WOOT! I’ll let you see the seal when it comes! Go to my site to see it! http://www.planetcazmoman.wordpress.com and congrats to Jim! thanks daballer, and don’t feel bad mariodude100. 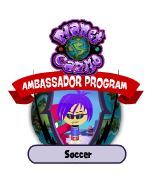 If you help others, be kind, nice, and have a site that advertises Planet Cazmo alot, then you will soon become an ambassador. cograts! Chief send me my ambassador hat , he told me that he forget to send it to me lol! congrats to every new ambassoder for achiveing this and i know metalica has been added too so well done i hope next time it will be me and mario if u remember you had trouble with wp a virus or something so just get ur blog up and running and show them hits smile!!! !